How to retrieve lost notes from iPhone no backup? How to recover missing notes from iPhone without backup? Read here to get back lost notes from iPhone without any backup easily. Quite obvious here: how to retrieve lost notes from iPhone without backup? It is not a fresh topic here. We have taught you how to recover lost text messages from iPhone without backup before, so today, the similar topic here. It is quite upset and anxious when important notes are missing from iPhone. The worse thing is that you did not make any backup data for those missing notes. So how to get back lost notes from iPhone without backup? Easy. Just keep reading and follow the method below. In order to recover lost notes from iPhone without backup, it is quite simple to make it if within the help from a professional iPhone notes data recovery tool--iFonebox. As is known that iFonebox is a professional iPhone data recovery tool which supports to recover deleted or lost text messages, contacts, notes, wechat messages, etc, from iPhone or iPad directly. Also, within the help from iFonebox, it is possible to extract and restore lost data from iTunes or iCloud backup selectively, without wiping any data on your iOS device, compared with restoring from iPhone backup directly. One more thing, iFonebox enables you to transfer recovered notes back to your iPhone directly, the same as contacts and messages. So amazing. Next, detailed steps will be shared to help you recover lost notes from iPhone no backup. Before that, you must download and install iFonebox on your computer firstly. Two versions are optional: Windows version and Mac version. How to retrieve lost notes from iPhone without backup? 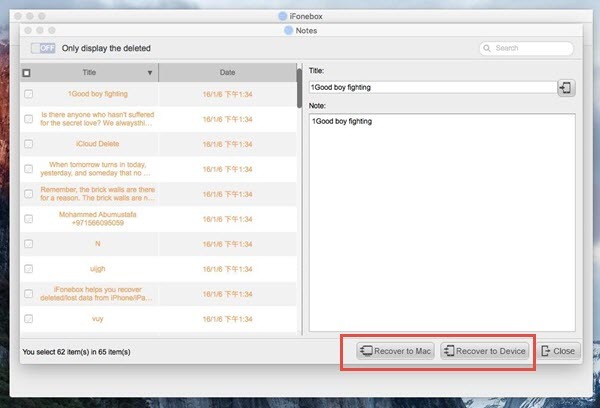 In short, under the help from iFonebox, it is quite simple and convenient to retrieve iPhone lost notes even though there is no iTunes or iCloud backup.